!Quiz Bird #4 Revealed/La Respuesta del Prueba No. 4! Our Mystery Bird from last week’s Quiz #4 was correctly identified by Member Liz Allen of Concepcion as a Rose-breasted Grosbeak. 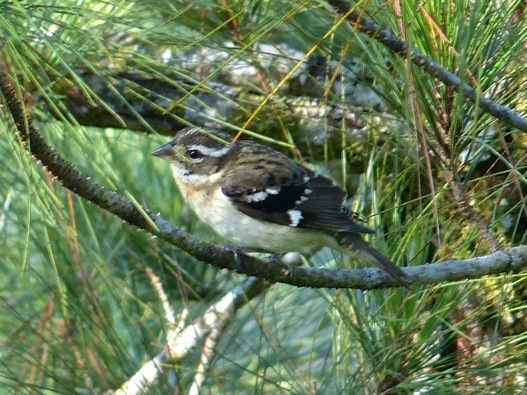 Rose-breasted Grosbeak (photo by Jo Davidson). Congratulations to Lety Andino of San Vito; Sandie Guthans of Baton Rouge, LA, and Dave Janas of Las Cruces who also correctly identified Quiz Bird #4 but sent their answers a little too late! Thank you to Member Jo Davidson for her photo of this Rose-breasted Grosbeak that is either an immature male or an immature or adult female. See photo below for an adult male! Felicidades a miembre Liz Allen of Concepcion: su respuesta estaba correcto: Rose-breasted Grosbeak! Tuvimos tres respuestas mas este vez de Lety Andino de San Vito; Sandie Guthans de Baton Rouge, LA, y Dave Janas de Las Cruces — todos correctos, pero un poquito demasiado tarde! Gracias a nuestra miembre Jo Davidson para su foto arriba de un pheucticus ludovicianus; esta un macho joven o posible una hembra joven o adulto. Abajo: un guapo macho adulto! Photo of a beautiful male Rose-breasted Grosbeak from Wikipedia. This entry was posted in Bird Quiz and tagged Birding San Vito Costa Rica, OTS Las Cruces Biological Station, Quiz Bird Contest, Rose-breasted Grosbeak, Wilson Botanical Garden by AWOlivieri. Bookmark the permalink.